** This review is published in Art Asia Pacific. ISSUE 109, JUL/AUG 2018. I experienced the 1990s in Istanbul as a child. I did not grow up in a family who regularly discussed politics, so what I remember from that period are mostly big gatherings with family friends and a feeling of community. The first major survey of Aydan Murtazaoğlu and Bülent Şangar, prominent figures who shaped the ‘90s Turkish contemporary art scene, presented as the reopening exhibition of SALT Beyoğlu in Istanbul, prompted a reconsideration of these glossed-over memories. Prints, photographs and installations from the ‘90s and early 2000s address a period that was in reality marked with the tightening of the state’s grip over citizens, enacted in the name of safeguarding the new neoliberal economic system; weakening workers’ rights; as well as the unsolved murders and kidnappings of Kurdish citizens who had been labeled terrorists. Yet, underlying the political and economic uncertainties of the time were the artists’ efforts in defusing the polarization of society, evident throughout the exhibition. 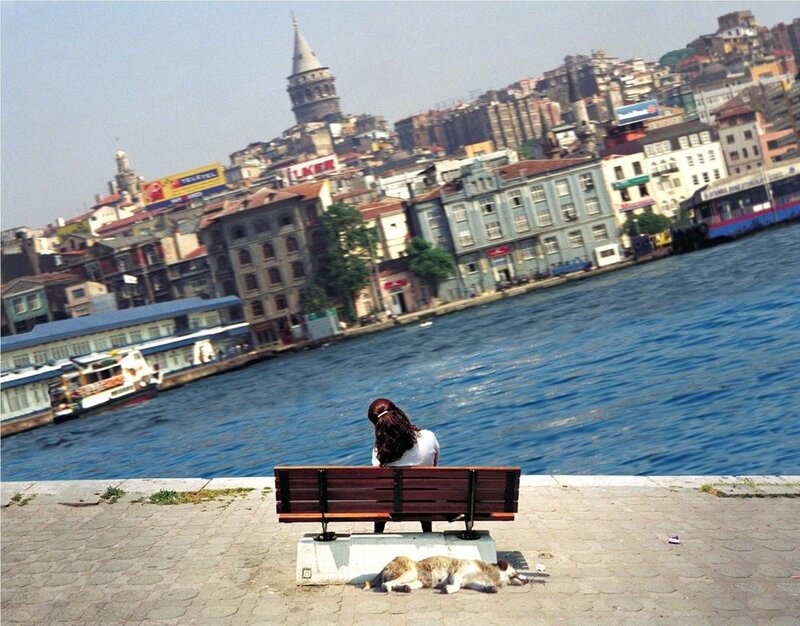 Most of the scenes captured in the show’s works, especially the photographs and the videos, depict the coexistence of individuals of different ages, political backgrounds and economic conditions in various public spaces, such as Şangar’s Untitled (1994), of a couple talking in Taksim Square. This brought to mind 2013’s Gezi Park protests, when citizens realized the power of banding together. Further proposing the significance of dialogue was the collaborative performance-installation Unemployed Employees-I found you a new job! (2006–2018) by Murtazaoğlu and Şangar. The work involved recent graduates from the art departments of local universities folding t-shirts while talking to the exhibition’s visitors about the challenges they face. These conversations were an attempt to spark much-needed empathy, and address the polarization of Turkish society, which is a pressing issue today. Even the artists’ tendency to produce in partnership with each other is a manifesto for this cause. Works made by the artists individually nevertheless echoed the possibility of solidarity as well. Şangar’s Move Forward a Little (2004–05) comprises close-up photos of different public buses, collaged into one big bus with two fronts. One can see that the only way for the individuals trapped in the malformed vehicle to move forward is for them to come up with a solution together. Untitled (Windows) (1997–2007), another photography-based work by Şangar, suggests that one method to contribute to progress is to at least become an active witness, rather than fully ignore society’s problems. In the series of film strips, Şangar tries to escape from the window of a house, while Untitled (Accident) (1997–2000), captures the mysterious murder of a man, also played by the artist, from behind a steering wheel in a car. What is asked of the audience is to simply become involved in piecing together the narrative. In Murtazaoğlu’s work, there is a second layer, which is the objectification of the female body in a patriarchal society—the suggested solution is the coming together of women from different backgrounds to enact change in their communities. Stadium (1993–95) is a photograph of young women at İnönü Stadium standing next to each other to form a diagrammatic figure of the ovary. The gathering subverts the official ceremonies held during country-wide holidays in the arena by inviting the attendees to celebrate their bodies and power, rather than a national event, as well as the function of the locale itself, meant to showcase typically male, physical prowess. In the photograph The Pilot (2001–03), a woman who is in official-like attire, with a white shirt and black trousers, talks to girls of Romany origin dressed in colorful, long skirts. Although more frequently seen in Turkey are scenarios of officials interrogating ethnic minorities, the faces of the three figures suggest an understanding towards each other. As we approach the 2018 general elections in Turkey, what little hope there was for the future is dissipating. With over 100 academics and journalists still jailed and increased levels of control from political authorities on freedom of speech, the exhibition directed us to think about the power that is in collaborative action—there is no better time to start fostering feelings of mutual understanding.